2. How 'Bout No, Scott? 3. Goonies Never Say Die! 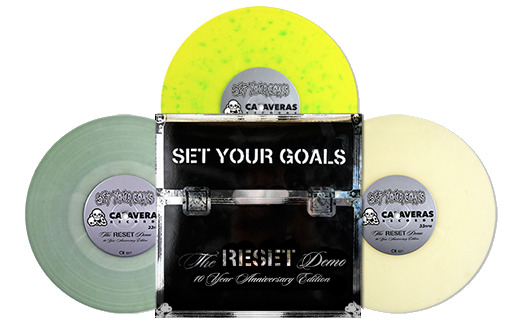 "San Francisco Bay Area's own SET YOUR GOALS first hit the scene with their demo EP in 2004. Like a string of firecrackers, it exploded with praise among music publications, social media, and message boards alike. Upon inking a deal with the band, Florida label Eulogy Recordings went on to repress the recording as "Reset" shortly thereafter. The band has since regained pressing rights to the recording, and vocalist Matt Wilson has chosen the EP's 10 year anniversary reissue as the debut release for his own Calaveras Records. Paving the way for acts such as A DAY TO REMEMBER and THE STORY SO FAR, SET YOUR GOALS carved out their niche with this release. Short and sweet, this is the EP that started it all."